My mind keeps returning to the Yukon Arts Presenters Summit. I had the rare benefit of debriefing with Michele Emslie, Summit organizer and Community Programming Director at the Yukon Arts Centre, over a few days and assisting in reviewing the personal and group action plans to which participants committed. I am struck by the leadership capabilities that underpinned the success of the summit; qualities that go beyond being adaptable or seeking to be relevant to stakeholders. Rather than define and solve a specific problem, the organizers held themselves to a different standard based on a broad goal: strengthening the Yukon arts presenting eco-system. Making such a broad goal central meant that much effort was spent on creating the conditions in which participants could discover and define the actions that were important to them. At heart of this design thinking approach lies understanding that a combination of empathy, creativity, analysis and synthesis as well as having explicit spaces for convergent and divergent thinking are essential. In short, by taking this approach, organizers succeeded in creating a space in which a diverse group of participants could learn, reflect, be inspired, meet and talk together and arrive in new places together. There was no pre-defined destination, no agenda in terms of specific outcomes, no boxes to check off, no need for linear progression. Rather, there was an invitation to join together on a journey of discovering common ground and action priorities. The organizers were focused on empowering participants from the start, knowing that the summit is its participants. They asked potential participants to co-create the content through soliciting feedback on hot topics and burning issues. 60 responses came in! 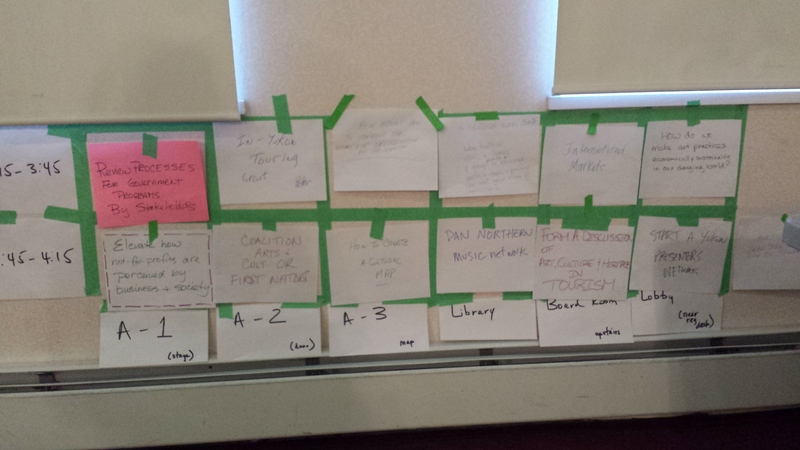 Organizers listened carefully and found five key themes to address. An important effect of this open, listening approach was that the tone of the summit, its ownership was already in the hands of participants well before they could even register for it. The Friday morning networking exercise using a photo, paper and markers to answer four questions: who are you/ what do you do, what is your hope for the future, what can you contribute to the summit, what do you need from it. A gift exchange: each participant was asked to bring a gift that represents something about them, their work or their community (using their imagination rather than pocket book). These gifts were randomly distributed at lunch and then everyone read the brief note that was attached by the giver and talked about what significance this gift held to them. There were all kinds of wondrous giver-receiver match ups and the exchange made for a profound sense of connection and some fun. 100+ people managed to share in plenary over lunch while staying on schedule for the entire conference. Each day’s opening reflections, ranging from an elder’s prayer to Haiku to Gramma Susie. Wisdom comes from many places and, in particular, the spaces in between. The summit schedule was action-packed, not because of featuring talking heads or experts, but because of its focus on facilitation, conversation, meeting and thinking together, and action planning. (As a speaker, I felt I was well briefed heading into the summit!) As a result this summit produced several big ideas and actions through collaboration, rather than consensus. Perhaps most important, it resulted in the ownership of these ideas residing within the community itself, owned by various champions and those who gathered around these big ideas. Conference organizers didn’t get a long task list back, but rather received a strong mandate to remain stewards of the process, facilitate the next steps and to continue leading by encouraging leadership from within the arts community. Using Open Space methods, participants pitched various initiatives for discussion and to see which ones were strong enough to warrant concerted action. I believe we are seeing a profoundly different kind of arts presenters network emerge in Yukon. Not one that becomes a membership-based service model over time and that might suffer the eventual difficulties that have become so well documented for many membership-based associations; but a living, breathing, creative community that gathers around common actions (which require a just large enough group to be interested in working together), that is highly responsive to emerging and changing needs, and that delegates authority to all participants while benefiting from unhurried and effective stewardship provided by the Community Programming Director at the Yukon Arts Centre (YAC). Finally, YAC is ideally positioned for this role as it is a territorially created arts centre whose mandate includes strengthening arts as an important cultural, social and economic force in the Yukon Territory as a whole. This close-knit, open network grounded in shared leadership and personal commitments, will show us how big ideas can be realized through concerted actions – unfettered from needing to establish narrow service priorities or delegating authority to a few (like a board of directors) – and thus able to grow and shift as the situation warrants. This entry was posted in analytics, audience, collaboration, conference, conversation, innovation, leadership, performing arts, relationships, strategy, vision and tagged Written by Inga Petri on December 16, 2014 by Inga. “Generosity of Spirit” was present throughout the Summit and contributed greatly to its success. Particularly from the ‘outsiders’ from down South. The Yukon Arts Presenters Summit brought so many creative and collaborative people together in an environment where big ideas for strengthening the arts could be discussed. I personally made many connections that I know will be mutually supportive in the future and felt that myself and the organization I work for will see many positive steps forward as a result of this summit. I would like to thank Inga Petri for her contribution to the Summit. The material she presented was very insightful and applicable to our arts organization and my position as Manager of Communications for the Northern Arts and Cultural Centre in Yellowknife. I was fortunate to go over some specific materials from our organization with her and get valuable feedback. She is very approachable and goes above and beyond what is expected of her. I would highly recommend her as a keynote speaker at any event. Thank you both for your lovely words, Jerry and Summer!